You never know where the conversation will lead when sitting in a dentist’s chair. On a routine checkup, one of our salespeople struck up a conversation about LoKnow with her dentist, who was the owner of Orchards Dental. He mentioned that Orchards was having trouble attracting new patients. Their website had been built by a company that specializes in working with dental clinics and this company was also managing their online advertising. However, as this company was based in Denver, they did not know where to effectively place Orchards’ ads to reach the people who lived or worked nearby the clinic. Orchards had been receiving phone calls from prospective patients in nearby towns, such as Sherwood Park, who had seen the ads and become frustrated upon learning that the dental clinic was based in southwest Edmonton—too far to drive for a dental appointment. Orchards needed ads that would target prospective patients in nearby areas of Edmonton, rather than being placed haphazardly throughout the city and surrounding areas. Orchards Dental was opened in 2016 by Dr. Nicholas Teoh. Born and raised in Edmonton, Dr. Teoh graduated from the University of Alberta’s School of Dentistry and is a member of the Alberta Dental Association and College as well as the Canadian Dental Association. Orchards booked a three-month trial beginning in April 2017. We introduced them to our innovative Hyper approach to advertising that allows us to target only devices whose owners have a set of qualities the client is looking for. We drew geofences around other nearby dental clinics to target patients entering those buildings and used Google AdWords to target the surrounding neighbourhoods. We also ran a Facebook campaign and retargeted anybody who clicked on ads. The results came in quickly and within the first month Orchards had leads and was achieving an incredible CTR. We built ads that focused on the family friendly nature of the clinic that mentioned the completed kids area, suggested bringing in the kids over the summer and recommended booking family appointments. Other ads targeted adults and suggested they use their benefits before they expire, mentioned the homelike environment of the clinic and informed that the clinic is open evenings and Saturdays to fit busy schedules. Click-through rate ranged from 9 – 17% higher than the industry standard and 28 conversions were made from online bookings. Orchards was so pleased with the results of the three-month trial that they booked another three months, which has become a monthly, recurring contract. 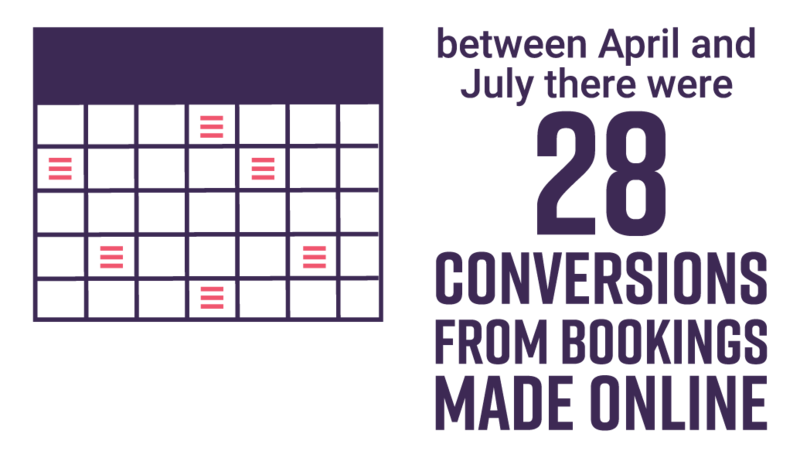 Between April and July there were 12 calls made as a result of AdWords and 28 conversions from bookings made on the website. CTR ranged from 9 – 17% higher than the industry standard during the same time period. Between contracts, when the campaign was paused for a week, Orchards saw web traffic come to a stop and attributes all of the website traffic and leads gained over the course of the campaign to LoKnow. We filtered out any devices that did not spend a substantial amount of time in these towns during the previous month. They were so impressed with the results, they ended the relationship with their former AdWords provider and jumped ship to us. A year’s worth of advertising was planned out, which is not the norm in this industry.